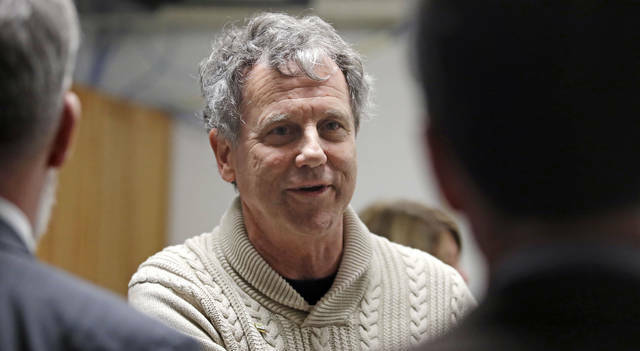 WASHINGTON (AP) — Sen. Sherrod Brown, a potential 2020 Democratic presidential contender, shrugged off arguments from liberals on Tuesday that signing onto the climate change plan known as the Green New Deal is essential to winning over the party’s base. The plan, initially championed by freshman Rep. Alexandria Ocasio-Cortez, calls for a New Deal-style mobilization to shift the U.S. economy away from fossil fuels such as oil and coal and replace them with renewable sources such as wind and solar power. Republicans have mocked it a progressive pipe dream that would drive the economy off a cliff and lead to a huge tax increase, calling it evidence of the creep of “socialism” in the party. The vote could be a moment of truth for several Democratic presidential candidates. The document is one of the first high-profile attempts at policy making from the newly empowered liberal wing of the party. It drew swift praise from several 2020 contenders angling for support from the party’s base. The Senate vote will test how far left those candidates are willing to go, risking leaving moderate voters behind. Opinion: Have Democrats Declared War on Cows? Reports of the death of America’s beef and dairy industries at the hands of the Green New Deal (GND) may be exaggerated, but both farmers and their Philly steak-’n’-cheese-eating fans have reason to be concerned about policies embraced by progressive Democrats. Supporters of AOC, as Ocasio-Cortez is known, argue that this FAQ document was mistakenly released, a work in progress, and doesn’t reflect the immediate goals of the Green New Deal effort. However, what’s undeniable is that cows — and their gaseous emissions — are in the crosshairs of the climate change activists’ agenda. They have to be. If advocates of the Green New Deal are serious about getting close to zero emissions, or even a net-zero target using offsets, they have to confront the amount of greenhouse gases coming from livestock. In the United States, agriculture is responsible for about 9 percent of our emissions. But according to the U.N.’s Food and Agriculture Organization, livestock worldwide account for 14.5 percent of global greenhouse gases. That’s more than the entire transportation sector (14 percent). Plus, climate activists argue that methane — the gas emitted by cows — is more dangerous than carbon dioxide, trapping up to 28 times more heat. It’s simply impossible to move forward on the GND agenda without a drastic effect on cattle-intensive industries like beef and dairy. Eric Holt-Gimenez says the problem is “industrial overproduction of food — the root cause of agricultural pollution, food waste and greenhouse gas emissions.” To discourage overproduction, he suggests a “guaranteed minimum price for farmers,” essentially an agricultural minimum wage paid by consumers to prop up inefficient, smaller farming operations. And New Jersey senator Cory Booker — a #GreenNewDeal supporter and candidate for president — stated flatly that the “devastating impact” of emissions from the meat industry must end. The media are downplaying the potential effect on the agricultural sector from the Democrats’ newest policy initiative, accusing Republicans of exaggerating the case or conflating idealistic goals with realistic policies. But ranchers and farmers have gotten the message. “You may think the #GreenNewDeal is some far-out nutcase dream, but if you’re involved in agriculture you’d better view it as a threat to your entire way of life,” Texas rancher Casey Kimbrell tweeted. But Ocasio-Cortez, who represents Queens, New York, doesn’t have a lot of “constituents with an agricultural background.” Neither do many of the congressional co-sponsors of the GND who are from urban districts, like Rep. Ayanna Pressley of Boston and Ted Lieu of Los Angeles. Ag jobs just aren’t a key part of their constituency. At the Iowa State Dairy Association website, board president Larry Shover quotes a study reporting that Iowa’s 1,200 dairies — and 213,000 dairy cows — have an economic impact of more than $4 billion per year. Still, virtually every nationally known 2020 Democratic candidate has endorsed the #GreenNewDeal. That’s going to present some interesting political calculations for Democrats in a 10-way (or 15- or even 20-way?) race for their party’s nomination. “Iowa’s farms are family farms, and so when Washington talks about America ‘getting out of the cattle business,’ it’s not just a job. It’s a family,” Olthoff said. The same misleading promises that surfaced repeatedly during the debate over the Affordable Care Act are being heard once again: lots more government involvement in your health care will save you tons of money. “Medicare for All” is the nice-sounding new name for the European/Canadian-style health care that has long been the holy grail of the American Left. A single-payer system, they insist, is just the ticket to lower individual and family health care costs. Small wonder that the notion of supposedly “free” health care at the point of service attracts enormous popular support. The Kaiser Family Foundation reports 67 percent public support for “Medicare for All,” with only 30 percent opposed. Getting more for less is well-nigh irresistible. But like President Obama’s promise that his government-managed health system would let you “keep your doctor if you like him” and deliver dramatically lower premiums,” these latest proposals sounds too good to be true because they are. Both “Medicare for All” schemes establish a new trust fund for health care financing, but neither provides any meaningful explanation of how they would finance such an enormous program. Title II, Section 211 of the House bill says it would be funded from “existing federal revenues” for health care. It would also impose new income taxes on the “top 5 percent of income earners”; levy “modest and progressive excise taxes on payroll and self-employment income”; a “modest tax” on unearned income, plus a “small tax” on stocks and bond transactions. Unfortunately, analysts at the Congressional Budget Office can’t substitute vague terms like “modest” and “small” for actual numbers to calculate revenues and costs arising from the proposals. At least he doesn’t pretend that only the rich would have to pay. Most of the new revenues supporting this plan would come from broad-based taxation slamming the middle class. It includes a new 7.5 percent payroll premium tax; a 4 percent household income tax; the repeal of tax breaks for job-based health insurance; and an array of new taxes on upper incomes, including capital gains and dividends, estate, wealth, and corporate income taxes. That sounds like it would raise a whole lot of money. And it would have to, because there’s a whole lot to pay for. The liberal Urban Institute and the conservative Mercatus Center both independently estimate the 10-year cost of Sanders’ proposal at $32 trillion. Emory University professor Ken Thorpe, a former adviser to President Bill Clinton, detailed the tax consequences for ordinary Americans and projected that Sanders’ plan would cost $1.1 trillion more annually than the senator’s earlier claims. Thorpe found that if it were fully funded, the Senate version of Medicare for All would require an additional 14.3 percent payroll tax and a 5.7 percent income-related premium. That’s taxing no less than 20 percent of payroll. And again, these are tax increases that would fall on virtually every income group in America, not just the “rich.” Thorpe concludes that 71 percent of working families would pay more for health care than today. Any way you slice it, Medicare for All requires new taxes on people of modest means at levels previously unimaginable. And this deadly combination of greater costs and massively higher taxation is integral to the plan. That doesn’t bode well for proponents of the plan. The same Kaiser survey that found majority support for the basic idea also found that even more Americans would oppose Medicare for All — by a sizable 60 percent to 37 percent — if it would “require most Americans to pay more in taxes.” Well, it would. And we’re talking trillions more in taxes. Those proposing Medicare for All must provide clarity on its true costs. Step one is legislative text on exactly how they propose to fund it. Then the CBO can conduct a comprehensive analysis of the House and Senate versions and project their impact not just on federal spending, budget deficits and the national debt but also on the tax burden for all Americans — in detail and on every income group. A fully transparent process, with open House and Senate hearings, would let taxpayers see the real price tag, not just hear lofty promises like those broken by Obamacare. Robert E. Moffit is a senior fellow in the Center for Health Policy Studies at The Heritage Foundation. He wrote this for InsideSources.com.